A Liberal's Libretto: Copper heiress Huguette Clark and "Empty Mansions"
Copper heiress Huguette Clark and "Empty Mansions"
As I have mentioned before ... many, many times before ... 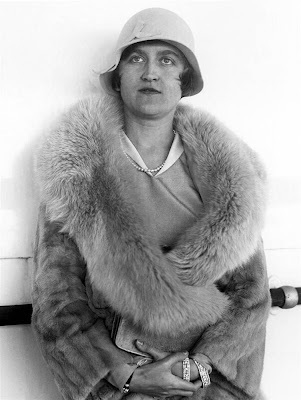 I am absolutely fascinated with the story of Huguette Clark, the Copper Heiress who died in 2011. Just shy of her 105th birthday, Clark died surrounded by many of her beloved dolls and the nurse that had been hired to care for her at the New York Hospital. Well, the book being penned about the life and fortune of Huguette Clark is set for release on September 10th - just 7 days shy of when the trial around her estate is set to begin. Written by NBC's Pulitzer Prize winning Bill Dedman and Clark relative Paul Clark Newell, Jr., Empty Mansions: The Mysterious Life of Huguette Clark and the Spending of a Great American Fortune is bound to be a page turner. Huguette Clark was 19 years old when her father - that would be copper baron and disgraced former Senator William Andrews Clark - died. 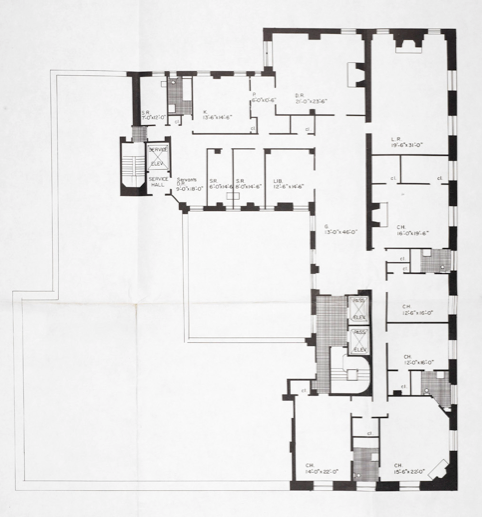 At that time, she and her mother moved to the penthouse at 907 Fifth Avenue. In addition to living with her mother, Huguette Clark was well taken care of, financially speaking. She received an allowance of $7,500 a month (that would be about $100,000 a month in today's dollars), and when she reached 21 she inherited one-fifth of her father's estate. This was an even split with his children from his first marriage. The entire estate was estimated at up to $300 million, or about $3.6 billion in today's dollars. During her life, Huguette Clark managed to take the roughly $60 million that she inherited - again, her piece of the Clark fortune - and increased it to include at the time of her death, $400 million, priceless works of art, a massive doll collection comprised of both French and Japanese dolls, numerous musical instruments and Real Estate holdings that include two estates and two apartments at 907 Fifth Avenue in New York. One of the apartments at 907 Fifth, reportedly the largest apartment on the island of Manhattan, takes up the entire 12th floor of the building. While the other apartment, which was where Huguette's mother Anna lived, takes up over half of the 8th floor. But, why did Clark remain - by choice - in the hospital for 20 years when she owned the largest apartment on Manhattan's Fifth Avenue? The 42 room, 15,000 square foot manse was decorated with priceless art, furniture and more of Clark's personal doll collection. She also owned an estate in Connecticut and, perhaps most famously, she owned Bellosguardo - a 21,666 square foot ocean front estate on 23 acres of pristine land in Santa Barbara. Not a single visitor had been to Bellosguardo since 1963 but, Huguette Clark paid to have the estate kept up by the same family of caretakers for generations ... in fact, many of the caretakers had never met Clark. Known by many for her generosity, she had cut off all ties to her extended family and friends about 6 or 7 years ago and it is rumored that only her personally chosen nurses and one of her attorneys were allowed to see her. A second attorney that Clark had hired used to have to conduct business with the heiress through a crack in her hospital room door. After passing away, Huguette Clark was entombed as she had lived - in a shroud of mystery. There was no funeral and her relatives were barred from paying their last respects. In fact, the location of her burial was also a mystery to many as it wasn't until right before her death that there was room for Clark in the family mausoleum. On the morning of May 26, 2011, before the public gates opened at Woodlawn Cemetery, her casket was carried by funeral home employees up the 18 steps of the Clark family mausoleum. The bronze door was open, leading to a private chapel with gold-inlaid ceiling, a tile mosaic floor, and an altar with the inscription, "Nearer My God to Thee." Huguette Clark was then laid to rest next to her father, mother and sister. After the door was closed, one single small bouquet was placed at the foot of the doorway. There is so much left to learn about Huguette Clark. More than the wealth - who was she? Why was she so reclusive? Gaaaahhhh! September 10th can't some fast enough! 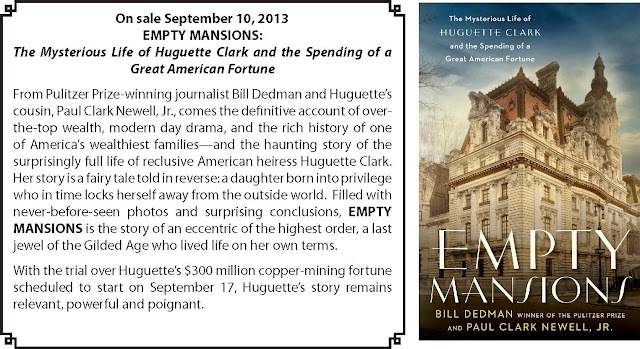 Pre-order Empty Mansions: The Mysterious Life of Huguette Clark and the Spending of a Great American Fortune today!